Arctostaphylos densiflora 'Sentinel' is a medium manzanita that flowers heavily. 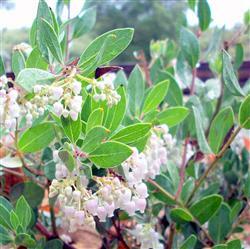 It is related to Arctostaphylos Howard McMinn and offers much of the same garden tolerance as McMinn. Sentinel has grayer foliage and is taller with a more upright habit than Howard McMinn. Height at maturity six to eight feet with a spread of five feet. Sentinel will tolerate a wide variety of soil conditions including heavy, rich soils but is much happier in sandy loam or sand and is more drought tolerant than the other Arctostaphylos densiflora cultivars. 'Sentinel' is one of the best performers in beach sand, while also being known as very clay tolerant. Like most other manzanitas it does not tolerate salt spray. 'Sentinel' has red bark and seems to be one of the faster growing manzanitas growing to full size in a couple of years.